The Cheapest Firewood for sale in Dublin. 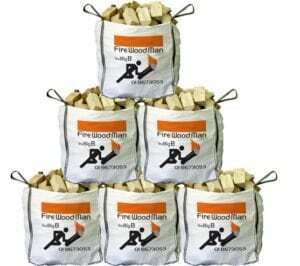 Buy 300 kiln dried fire logs today. 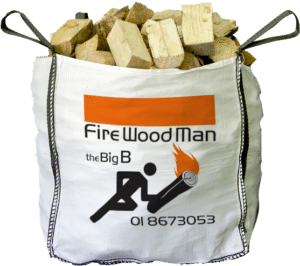 Just buy the Big B and we’ll deliver to your door a bag of 300 quality firelogs. It’s a mixed bag of the best logs available on the market at any given time, sourced from sustainable sources and kiln-dried to ensure a moisture content of less than 20%. No need to move them immediately as the bag is completely water-tight and breathable. You can also move a few at a time because the bag is re-sealable too! Firewood Man is all about simplicity and quality. Why spend time looking through many choices of different wood types to buy firewood? Why end up buying poor quality wood Why buy large open crates of wood, that have to be moved under cover immediately, just to save money? Why be forced to buy lots of smaller manageable bags to avoid dealing with large crates? Why fear your wood getting soaked on the day the delivery arrives because it’s raining? Why worry about whether your firewood comes from managed forests? We knew that there was a simpler way and so we created the perfect solution – the Big B! The Big B is the easiest way to order firewood, but if you want a specific type of wood, we can do that too. The same quality, the same quantity, the same bag. Just visit our ‘Choose Wood Type’ page to choose from any one of our five types of wood on offer. If you have any further questions about our company or the firewood we offer, you can contact us on the telephone number shown, or alternatively complete the form and a member of our team will contact you. Copyright 2018. Firewood Man. All Rights Reserved.